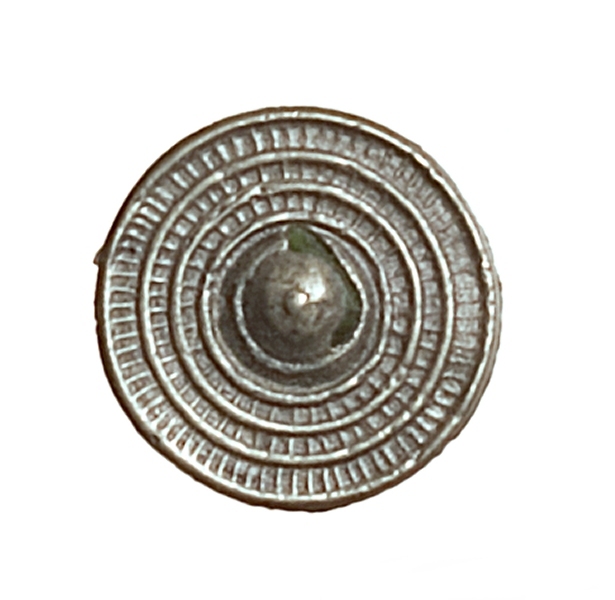 Measuring 24 (0.95 of an inch) millimeters in diameter, this Late Saxon disc brooch is made of tin alloy and glass. Circular in shape, the brooch is set with a hazel/grey glass bead made to imitate a gemstone. Sometimes, these beads still have the skin of the metal over top of them – a feature the jeweler would have removed later in the brooch-making process. Stemming from the center bead, there are rings that increase in size, with the last one forming the rim of the brooch. Within each ring layer, there are vertical lines that stretch outward, giving the brooch a textured appearance. The brooch was found on Cheapside near Bow Church, where it was discovered during an excavation of a sewer in 1883. This brooch was found among what appears to be the remnants of a Saxon jeweler’s brooch collection from the eleventh century. Various fragments of pewter brooches, rings, and beads were also discovered, suggesting the site of a jeweler’s shop that had to close or was abandoned since many of the brooches were still in the process of being manufactured. Though simple, this disc brooch is unique because it is set with a bead to replicate a precious gemstone, and has a ridged pattern. The use of glass is significant, perhaps indicating a high-end jeweler with a wealthy clientele. Aside from the use of more expensive materials for the decorative element found on brooches, the metals which they were made may reveal more information about the society in which the jeweler lived. The jeweler's community may have been involved in trade with other local and foreign countries in order to obtain these precious materials found at the excavation site. 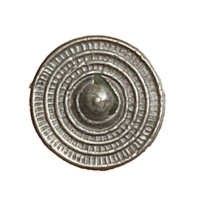 Of Saxo-Norman Origin, “Disc Brooch found on Cheapside near Bow Church,” Medieval London, accessed April 22, 2019, http://medievallondon.ace.fordham.edu/items/show/51.